An exploration of the 2008 global crisis and responses. This article looks at militant reformism and the role of existing means and channels of settling disputes in society. Equilibrium and social forces of stability are identified for their central role in determining the depth and potential of crises, and distinguish simple crisis from situations with more radical potential. In an era of the indignants, or in an era of riots as Blaumachen calls it, what is the meaning of the upsurges that appear to be swelling up from the ground? Worldwide, the unfolding of a crisis is daily ripening, spreading, and moving in ways that have been hard to anticipate. 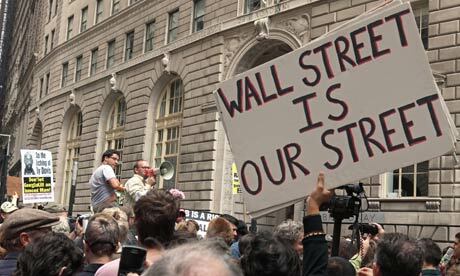 In the United States, we could ask what was the meaning of Madison and the Occupy movements? We are in the midst of a crisis of capitalism, though one in which it is nearly impossible to predict whether it is the final crisis or merely another cycle of recomposition of existing forces and class arrangements. In such a crisis there is a renewed spirit of combativity amongst the exploited and oppressed. This is not to say that crisis inherently creates consciously organized class formations, quite the opposite. Crisis to a certain extent renders naked the failures of the system to provide any legitimate organization of our ways of living. Yet, as we have seen in the recent rise of the indignants in the Occupy movement, or dispossessed workers in Madison, the system is judged against the existing social relations and organization. Dispossession creates formations aimed against the new recomposition of classes, but in terms often deriving from the previous formations and hierarchies. Within that process there is the creation of factions which seek to retain old formations, and groups which point towards a different future. In the destruction of previous arrangements, new protagonists are created which not only question dispossession, but also question the whole class and hierarchical scaffolding upon which all the benefits, privileges, and parsing out of life’s joys and woes are built. It is here that Arshinov offers deep insights in his discussion of the betrayal of the laboring classes by those seeking to erect new forms which preserved their role in the old order. He states that it is in the decomposition of the old regimes that we see both the parasitic reformist leadership that emerges as well as the laboring classes developing their own conscious forces that fight not merely for their immediate interests but for their future without intermediaries. Decomposition is crucial, because in this concept we see that it is not merely crisis or combativity that fuels a revolution, but the particular relationship of systemic crisis of the economy to the forces of the State which stand at the center of revolutionary upsurges (not merely as a tool of capitalists, but as the locus of organizing and upholding capitalism). Combativity and consciousness are not the same, and not all combativity is inherently revolutionary. What is often called recuperation or cooptation of struggles comes to this: what is the relationship of struggles, autonomous or self-governed struggles, of the exploited to existing means of settling disputes? To what extent are popular struggles able to be accommodated within the boundaries of existing institutionalized forms of power and their ability to resolve disputes (peacefully, ideologically, or by force)? A major mistake of the anarchosyndicalist movement was the failure to foresee the ability of the system to widen the scope of possible legitimate struggles. Outside of Spain, it was not necessarily repression that defeated the movement, but perhaps the integration of previously threatening struggles into capitalism itself. For as long as struggles can be accommodated within the system, it will be difficult to either build any organization of permanent insurgency, or to create conditions for large-scale radicalization that can sustain beyond short-term struggles. Looking at it from another angle, it is the inability of the system to accommodate struggles in crises that leads to the vacuum in which a revolutionary future steps into. This vacuum is created by the doors which crisis closes. Crisis limits the resources and positions which the system may take without engendering new enemies or deeper collapse. Crisis raises the stakes of both of accommodation and recomposition, it makes it harder for the ruling class to deal politically with struggle. In normal times, there is a political and economic surplus such that there is sufficient unity to incorporate or repress struggles. As crisis deepens, it becomes objectively difficult for the ruling class to dole out benefits or to unify in order to impose their order. Each move engenders new enemies, both proletarian and capitalist. The breakdown of the ruling class’ ability to govern is real crisis, not merely temporary economic catastrophe. Yet this is not what we see in Wisconsin and Wall Street. What do we make of reforming corporate personhood, recall elections, and renewed demands for social welfare? What of the populist framing of the big guy versus little guy? 99% vs. 1%? We do not yet see the scale of breakdown which would make insurgent movements sustainable. Indeed the system’s ability to respond is still quite robust. Reforms that point to the past do appear on the table, and to many represent the necessary correction of an immediate problem. For this reason, it’s logical that a populist framing would become the voice of the movement, and speaks both to right and left populists. Despite the crisis, these struggles around dispossession illuminate the possibility of what Nate Hawthorne calls “militant social democracy”. Militant social democracy is the voice of reformism that is attempting to institutionalize anti-dispossession struggles within existing class and state formations. As the existing means of settling disputes breaks down, militant reformism is one such response. In the great depression the divisions between the CIO, TUEL, and IWW reflected these dynamics. Today we see organizing in the service sector coming to play a similar recuperative role so far. Yet, as global markets continue to stumle it’s unclear whether in this crisis, such a compromise could be delivered. There’s good reason to believe it might not. For one thing, these revolts are worldwide in the middle of a cycle of mass proletarianization that has left much less room for finding new sources of capital then in the past (Africa looms large though on the horizon). Secondly the unity between the capitalists appears to be splintering as the scope both of the crisis and anti-dispossession struggles grow. What effect will further disruptions in India, Latin America, Southern Europe, or the Near East have? Militant social democracy has a real cost, and to bear that cost you need to be able to impose your position on those that stand to lose. Should militant social democracy become powerful enough to make that a desirable option, it’s unclear whether that would simply magnify the crisis into full -blown meltdown. So far, the ruling class seems content to try and impose a global reduction in standards of work and living, a strategy with its own dangers. Economic crystal gazing is rarely accurate or useful. Still, there are tensions there we can see. Militant social democracy will not be simply transient, possible or not. Yet if the system is unable to deliver the means to incorporate these struggles, or there is a widening of struggles that takes it outside its usual channels, we enter into a new era in which new possibilities emerge and previous guides become lost. Through seeing this dynamic, we can appropriate a better ability to anticipate and respond to new political events. It is the rupture with existing means of settling disputes that opens the door for the creation of new revolutionary protagonists who can transform the social relations that defined them. Yet as long as the system appears to be robust, it’s understandable that the emergence of class protagonists will have a difficult time coming to fruition. This isn’t to argue for throwing up our hands in these situations. We rarely if ever have a good sense of where we are on the road. Likewise our agitation and interventions, though not necessarily the deciding factor, do have causal importance in the maturation of revolution. In many ways the complexity and evolution of society is such that we both don’t know the effect of our actions, and our actions in the right context can have impact disproportionate to our abilities. Standing where we are as thinking reasoning creatures, we won’t be able to know one moment to the next how things will fall. Still, seeing this trajectory of power and crisis is key to having a sense of where we are. There are tasks specific to different moments, and we are better able to respond when we see the direction of struggles, state of dominant power, and objective crisis. This is the road we are traveling on in the coming year. This isn’t to say that those workers can’t or won’t intervene and transform the situation.